English: Cleopatra is a 1963 peplum movie, directed by Joseph Mankiewicz. 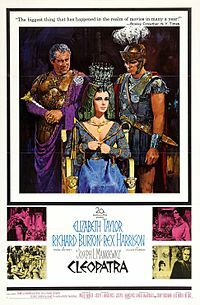 It starred Elizabeth Taylor as Cleopatra, Richard Burton as Marc Anthony, and Rex Harrison as Julius Caesar. Media in category "Cleopatra (1963 film)"
This page was last edited on 28 October 2018, at 19:29.